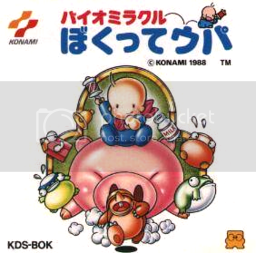 Bio Miracle Bokutte Upa was never officially released outside of Japan, but North American gamers may still be familiar with it under another name: Baby Mario. Indeed, the game made its way on our side of the Pacific as a bootleg. Strange that with all of the games that crib from Super Mario Bros.’s mechanics, this game would be disguised as a Mario game, as its gameplay is quite unique and completely unlike SMB. Then again, the people who played Baby Mario back in the day probably didn’t find it so strange; they were used to sequels like Super Mario Bros. 2. I’ve already spoiled the punch but in BMBU, you play as baby, Upa (you can pretend he’s Mario if you really want to), who probably is the only one who can save the day after some villain did something bad. Not important. Upa can crawl and jump around, and attacks with his rattle which makes enemies inflate for some reason. Once inflated, those enemies start floating away and you can use them as makeshift platforms if you jump on their backs. You can also hit them from any other angle than above, and send them flying, killing the enemies in their path. But look out, they will ricochet against ceiling, floor and walls, and hurt or kill you if you are not careful. The inflating mechanic is really central to the game, as you will absolutely need to create platforms at times to progress, and sending inflated enemies at bosses is the only way to kill them. BMBU may be literally a “baby game”, but it is not necessarily one figuratively: there is plenty of challenge to be found in this game. It is a NES game after all. However, it’s the “good NES game” kind of challenge, not the “throw your controller across the room” kind of cheap difficulty that so many NES games have. The enemies and bosses are repeated throughout, but the level design increases in complexity as you go, requiring always more and more precision. 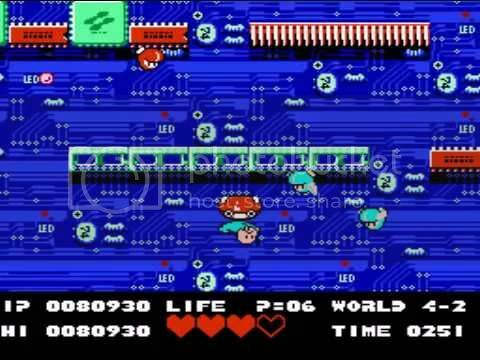 There are 7 worlds, with 3 stages each, and should you run out of lives, simply use the infinite continues to restart at the first stage of the current world. There are a surprising number of “gimmick” stages that spice things up and surprise you. 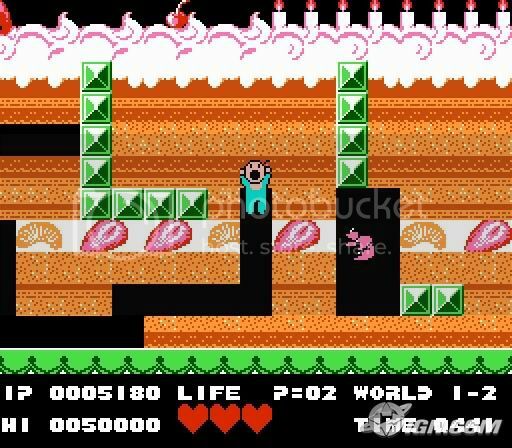 For instance, the second level in the game has you eating your way through a giant cake, and suddenly controls like Dig Dug. Further in the game, you will be platforming upside-down (which seriously screwed me up for the first minute until I adapted). It is the kind of neat stuff that reminds you of the days when Konami made good games. Admit it, that last sentence hinting at Konami being terrible today shocked you far less than you would have expected. The graphics are not the best the NES could offer, but they are still pleasing. Upa, as basic as he looks, still manages to look cute. Except when he’s swimming, then he creeps me out a bit. Can you say “flipper baby”? No, the graphics are adequate. If there is a problem with the presentation, it’s the music: there is not enough of it. I enjoy the rocking tune that plays throughout the game, but you eventually get sick of it. Make sure to download a couple of podcasts before sitting down for the afternoon it will take you to beat this game. The Virtual Console’s existence was easier to justify back in the early days of this generation of consoles, when it was one of the few sources of retro gaming. But since then, 2D platformers have known a renaissance not only on various download services thanks to indie developers, but also on the retail market with Nintendo cranking out new classic after new classic. Still, I feel confident recommending Bio Miracle Bokutte Upa. The game is unique, well-made and fun enough to still be enjoyable today, and inflating enemies to use them as platforms or weapons has not been reprised over and over again so it manages to still feel fresh. Those who have played all of the new 2D platformers and are only craving more should check it out. I've been aware of this game for awhile, but wasn't sure how good it was exactly. Those stages like the Dig Dug one and upside-down platforming level sound pretty fun. Why don't you like the Konami of today? I don't have any problem with their output recently. I love that they're continuing to make Contra games, and Silent Hill: Shattered Memories was incredible. Bah, I don't count the games they farm out to Western developers. I'm talking about Konami Konami. Great review! But I'm not sure I can agree with it, haha (I probably do though ). The only thing that's familiar to me after all these years is the first level and the cake one although the upside down level does bring back some memories! Glad you ended up enjoying this one. I was really worried that the only thing this game had going, for me anyway, was the nostalgia factor and that it didn't hold up that well today. Sounds like that's not true at all and that it's a good import people should enjoy. Great review, indeed. I snatched this VC gem up the day it was made available (I love unknown-to-me, quirky games). I wasn't disappointed in the least. I enjoyed my time with the game and still revisit it from time to time for some quick platforming fun. I have to say, though, that one my favorite parts of the game that still gives me good cause to grin is when he becomes invincible and starts running around. He's just so darn cute you want to squeeze him to pieces! But if you tired, he'd smack you across the head with his rattle. Hmm, re-reading this review, I'm not quite sure I'm happy with it. It sounds so... impersonal. "This is a game. It's a platformer. You play as a baby and it feels fresh because it's not Mario. Recommended to people who like this kind of game". I did enjoy it, though. It's just hard to describe what makes these old platformers fun, especially when they're not as action-y and momentum-based as Mario. You didn't need to be worried, even if I ended up not liking it, I'm always glad to get to try something new. Thanks again for the gift! I actually downloaded this after it was gifted to you. I remember my friend in elementary school used to talk about "Baby Mario" and up until the Secret Santa thread, I assumed, for 23 or so years, that he was full of crap. I believe I'm on World 4. I should get back to it. It's certainly a better game than that "Crescent King Hell Control" thing you pushed on us like a pimp and his somewhat attractive, yet chlymidia-ridden prostitute. ...Me, obnoxiously insisting others play something I like (instead of what I usually do, being so unsure that others will like a game as much as I did that I fastidiously list all the negatives, and probably turn away more people than I convince)? I think you got me confused with someone else, buddy! Sorry, "Curse of the Crescent Isle." The Indie 360 game. I actually had a little bit of fun with it though, so all is forgiven. Plus, you didn't actually play it so it was my mistake. I like blaming others. I'm just that kind of guy. All of a sudden, I want a warm Crescent Roll, filled with jelly. So Baby Mario's actually good, huh? But he doesn't look like Mario at all! The inflation mechanics kind of remind me of Dig Dug (which was probably an inspiration, judging by that level), but they seem more similar to Snow Bros./Bubble Bobble since you can attack with inflated enemies. This game might have come out before both, though. Well, maybe not Bubble Bobble. I loved this game when I was young. I would play with my head upside down in the inverted gravity stages. The graphics were way better in my head though.